A prequel to the video game by the same title. The video takes place in the year 2065, six years before the events of the video game. In the video, three wielders of the "divine weapons" from the Fenrir Far East branch, an elite military task force, arrive at a military operation against the powerful creatures called Aragami. One of the three, Souma, is a protagonist in the video game. The events of this story takes place six years before God Eater. The year is 2065 and three members from the Fenrir Far East Branch, an elite military task force that was sent to a strategic command base to assist troops in guiding an Aragami Colony towards a nuclear fusion reactor in which would be detonated to wipe them all out, but the story mentions some things to take note of. 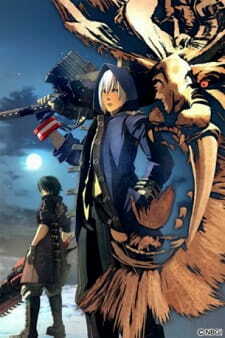 Throughout this prologue, you’ll meet three characters, Soma, Lindow, and Tsubaki. For those who are watching this for the first time, you’ll only get to learn about two of the main character’s name, Soma and Lindow. You don’t get to learn too much about these characters except that each of them is capable of doing the work of an entire battalion and that they wield these “divine weapons” that can kill mysterious monsters known as Aragami. Upon watching the episode, you’ll find out that Soma is the son of Director Schicksal and that it’s his first mission. However, even though we don’t learn anything about Tsubaki, like her name, we do see some similar physical characteristics between her and Lindow, leaving you to guess if they’re related somehow. There’s no opening or ending theme song for this, the Japanese acting seemed to be fine, and the art looked almost plain, but I didn’t really mind it. Overall, this episode somewhat provides a backstory for Soma, but it doesn’t reveal too much detail about the other main characters or the story. What this prologue fails to do is make us feel emotionally invested about the rest of the characters and the storyline and makes this episode feel like another senseless fighting scene. For newcomers watching this, you may have many questions unanswered such as, who is Lindow and the other female member, where did these Aragami creatures come from, and why are they such a threat? For those who never played the game, you may be confused on what was the point of this episode, but it’s supposed to set up for the game and upcoming anime, that takes place in the year 2071, God Eater. The story is set in a dystopian future universe, the year 2065 A.D. where humans have to fight against demonic creatures called Aragami for survival - It's been done before but this universe has a twist. The art is rather pretty but too simple, they will probably fix this a bit in the anime adaptation, but even though the original character design isn't bad they look too transparent and lifeless because of the lack of detail. You can differentiate at once who the main characters are and who the expandable-this-guy-is-gonna-get-eaten #1 and #2 are. The Aragami don't look bad at all, there's your fair share of blood and if you're easily frightened the dynamic movement of some Aragami might catch you off guard. Nothing memorable, at times non-existent. Not like you can learn much about the characters from a 12 minute special but if you played the game or know anything about it you'll see that most of the characters are quite loveable despite their flaws.